Bentenyama Pure Water Park (弁天山清流公園) is a park with BBQ facilities and fishing ponds located in Hatajuku, Hakone. The park takes the water of Sukumo river, and offers three different kinds of fishing: Hand catching, fry-fishing and bait fishing. 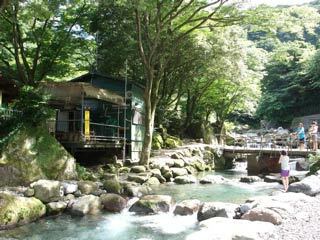 The water of Sukumo river is very pure and air around the park is so fresh. One of the best spot to enjoy nature and BBQ at Hakone. Rental fishing rod and the license is 3700 yen. Hand catching, 3200 yen for 8 fishes. This is great spot for family activities. The fishing they offers are for both beginners and experience people. This place also rents and sales BBQ equipment including coal. So, you can enjoy BBQ with fresh fish from the river. Note: You have to pay fishing license to enjoy BBQ. Make reservation here: http://www.hatajyuku.net/masu/mstsuriba.htm Japanese only.